Little Miss Perish is one of the coolest characters I have ever come to meet in a novel. She is talented, cool, quirky and fun. I found myself hoping I could’ve been cool enough to hang with her in high school. Cagan creates such realistic high school experience for the reader. The story is written like a journal, and Piper’s voice is so genuine and real. It is exactly how you would imagine a senior in high school to write about her daily feelings. 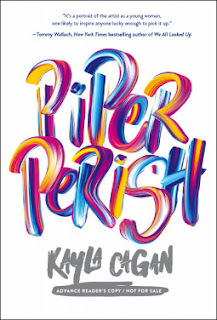 Throughout the story, Cagan introduces the reader to several of Piper’s close friends. They are all artists and have a great relationship with one another, constantly planning their future in New York City together. I loved how each of the characters had their own quirks and individual personalities. They truly care about Piper, and that shows in their interactions. Not all of the characters were rainbows and sunshine. Piper’s sister Marlie does an excellent job of bringing the reader’s head out of the clouds and back to reality with her difficult personality. Throughout all of the ups and downs, Piper is a fighter and keeps going after her passion. Cagan wrote a beautiful and fun story about a young artist and her fight to make her dreams come true. There are always pros and cons to a book, but in this case the pros most definitely outweighed the cons. I would highly recommend this book to readers who enjoy contemporary young adult novels.